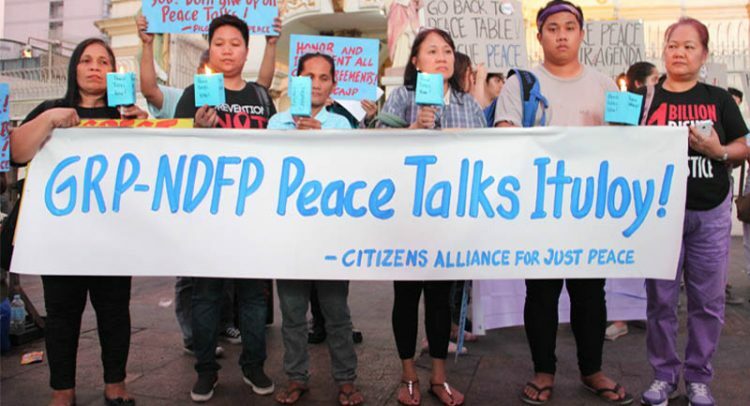 The National Council of Churches in the Philippines or NCCP celebrates the 3rd round of formal peace negotiation between the Government of the Republic of the Philippines and the National Democratic Front of the Philippines this month. We are edified that this third round is taking place in Rome within the octave of the Week of Prayer for Christian Unity. We will pray especially for the successful negotiations as we always uphold the peace talks in our prayers. We will pray that the men and women directly taking part in the process will take to heart the urgency and importance of the agenda on the table, mainly the Comprehensive Agreement on Socio-Economic Reforms or CASER. We recognize that the peace negotiation is a political process. Our enduring concern for peace and justice bid us to support and pray for its success. Our fervent prayer is for the resolution of the economic injustice that has bred the social unrest for a long time. We hold on to the long awaited political reforms, as well. We owe this much to the generations after us. Meanwhile, we press the government to honor agreements and release all political prisoners. As we urge our constituency to be unceasing in prayer for peace so do we exhort the members of the negotiating panels to be resolute in resolving the strife that has been going on for almost half a century. We thank the Royal Norwegian Government for its crucial role as Third Party Facilitator.